The third edition of Middle East: What Can Cinema Do? has reached its close, successfully bringing together a varied audience, from activist to just curious, to see the films and be part of the daily conferences that have contributed to the growing importance of this Parisian biennial event. The festival came to a close on the day the conference in Annapolis opened with heads of state seeking once again to find a solution to the Israel-Palestine conflict. In our own modest way, the daily debates confronted and discussed the issues, raised the ongoing questions and used cinema as a vehicle of communication. 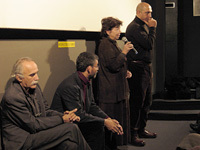 The 50 films showed the difficult situation of the Middle East: what it means to stand hours on end at a checkpoint for a Palestinian or to have your village divided in two by a wall, the prison that the people in Gaza live in, the hardships of the Iraqi people living under American occupation, the national censorship imposed on Syrian filmmakers and the destabilisation of Lebanon sending the young people into the streets in search of their homeland and identity. But we did not only show the hardships, also the daily life: video workshops for children, activities of self-expression at the Freedom Theatre, or through capoeira, or football, or music as seen through the Jubran family who have endured occupation all these year by plunging into music. Cultural expression is essential in war- torn regions as anywhere in the world. What Can Cinema Do? This question is embedded in the name of the festival, created by Janine Euvrard, who unfortunately was unable to be present due to illness. 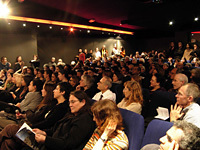 It can bring filmmakers together to share their films, make new contacts, and see other professionals in Paris. 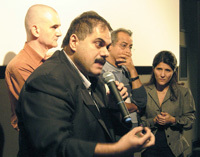 Filmmaker Adel Salam Shehada who succeeded in finding a way to leave Gaza to be with us remarked that he had not seen one of the other Palestine filmmakers present, Azza El-Hassan, since 2000 in Qatar. And here they met again in Paris in 2007. It can bring audiences in contact with filmmakers. At times the debates between the journalists, specialists, filmmakers and members of the audience became quite heated, when extreme points of views clashed on subjects that are very complicated at the core. It can raise the issues. For Israeli co-director Aya Kaniuck, "each film creates ripples like a stone thrown into the water and those ripples create other ripples. Like a seed planted, some will grow immediately; others will remain dormant and sprout at a later moment." For Lebanese filmmaker Nadine Naous, "no, cinema cannot solve the conflicts of the world, but our films are already an expression of ourselves and our lives and allow us to bring the questions forth and to discuss the issues." For Liberation Journalist Christophe Ayad, "films can open our eyes to see". For a member of the audience, "they are windows into the world". And yet another member of the audience, "you filmmakers should realise that you have an attentive audience that comes into a theatre and sits down to watch a film for an hour or an hour and a half. You have an amazing power during that time to convey your point of view." It was in this spirit that we finished this film week at Reid Hall – Columbia University's campus in Paris - under the theme of Together We Stand for the screening of Knowledge is the Beginning, a documentary that shows the marvellous musical adventure of the West-Eastern Divan Orchestra, founded by Daniel Barenboim and Edward Said. See you in 2009 for the 4th edition.